Spring is heralded by the appearance of daffodils, crocuses and tulips. Summer brings geraniums, baby's breath and morning glory. And if your dog eats them, he could die. Puppies and even some adult dogs just love to treat the flower bed as an all-you-can-eat brunch. However, many common plants that people grow in their gardens or yards can cause serious illness or even death if swallowed. People living in warm climates have more types of plants to worry about, because of the greater variety of species. In Canada and other colder areas, there are fewer garden plants to choose from. But no matter where you live, there are still a great many dangers awaiting the average dog in almost any back yard. Not all toxic plants cause the same reaction. Depending on the chemical in the plant, ingesting it can cause heart or respiratory problems, stomach upset, excessive salivation, seizures, shock or any combination of these. The most toxic can kill a dog very quickly. Here are some common plants you should remove from your yard if your dog has access to them. A lot of them are unsafe for children, too. 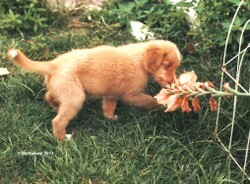 Most puppies can't resist chewing on flowers. Even a dog that normally leaves shrubs and plants alone may pick up clippings or play with sticks from the ground and ingest the poison. Azaleas, rhododendrons and oleander are all potentially dangerous. They affect the heart. While some varieties of azaleas and rhododendrons are safe, don’t take a chance. If you don’t know for sure, remove them. Nandina, a type of bamboo, contains cyanide. Holly, black locust, oak, elderberry, golden chain, wisteria, yew and many trees that produce nuts (and the nuts themselves) are not safe. Macadamia nuts especially can be lethal for your dog. If you have unidentified shrubs in your yard, take photos to a garden centre or go on-line to get them identified and to find out if they are safe to have around pets. People growing native species may have jack-in-the-pulpit or mayapple. Both are extremely toxic. Buttercups also are toxic, but not nearly as dangerous. Other garden plants to avoid include bleeding heart, monkshood, larkspur, foxglove, ivy, eucalyptus, most lilies, lily of the valley, iris, clematis, chrysanthemum and primrose. Sometimes just the bulb is toxic. This is the case with daffodils, tulips, elephant ears, hyacinth, and gladioli. If your dog is a digger, don’t plant these where he can chew them. Rhubarb is dangerous for dogs, as are many fruit seeds. Apple seeds and the pits of cherries, peaches and apricots all contain cyanide. Peach leaves are also bad. Unripe berries aren’t good, either. A dog that eats too many grapes or raisins (one handful is too many even for a big dog) can develop acute kidney failure. Most dogs love ripe tomatoes, but green tomatoes and tomato stems and leaves are toxic. And don’t let your dog eat raw onions! They are extremely toxic to dogs in even in very small doses. If you think your dog has eaten something poisonous, grab a sample of the plant he was eating or chewing on and take the dog and the sample to your veterinarian right away. If he has vomited, put a plastic bag over your hand, collect the vomit, turn the bag inside out so the sample is now inside, tie the bag shut and take that, too. If your dog is having seizures, is in distress or unconscious, call ahead so the vet will be ready when you arrive. These are very serious symptoms. In Canada, the USA or the Caribbean, you can call the Pet Poison Helpline at 1-800-213-6680 any time, 24 hours a day. There is a $39 per incident fee, payable by credit card, but it covers the initial consultation plus all follow-up calls associated with the management of the case. You also can contact the ASPCA Poison Control Center at 1-888-426-4435. A $65 consultation fee may be applied to your credit card (amount subject to change) but the facility is open 24 hours a day, 365 days a year. You can find out more on their website. Both centres deal with all kinds of poisonings from toxic plants and chemicals to snakebite or other envenomation. Smart pet owners will find out which local vets have emergency hours and the locations of those clinics and any emergency clinics in the area before any emergency arises. Write down the names, addresses and phone numbers of these clinics and put the information where you can find it fast, such as on the wall by the phone, on your fridge and programmed into your smart phone (if you have one). Often, time is of the essence in treating dogs that have been poisoned. Here are some books you may find useful. Be sure to read them before an emergency occurs, because that will help you know what do do and also what plants and other items need to be kept away from your pets. As a dog owner, you know that chewing, jumping and chasing are favorite dog activities. In order to avoid furniture damage, you should provide your pet with some chewing toys. I’ve been looking into getting a portable pen for my dogs. Here’s what I’ve found out about them.